Pearl tin cups, the most favored among bridesmaids and brides alike is the next best thing to a strand of pearls. 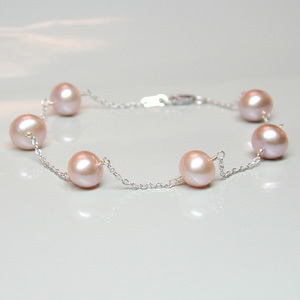 This delicate 7 inch bracelet with 6 semi round pink color fresh water pearls are a perfect match for those cream or pink colored bridesmaids dress or even for the white satin wedding dress. If your always looking into buying something you could wear over and over again with any outfit this pink tin cup is for you. Pearls measure 7 x 7.5 mm and chain is 14K white gold. Matching pink tin cup necklace is available in the pearl necklace to purchase select from the drop down below.